These Essential Services are offered with compassion and expertise to Every Dog! XTRA LARGE DOGS - $90/HR. Scroll down to read more about each Essential Service. 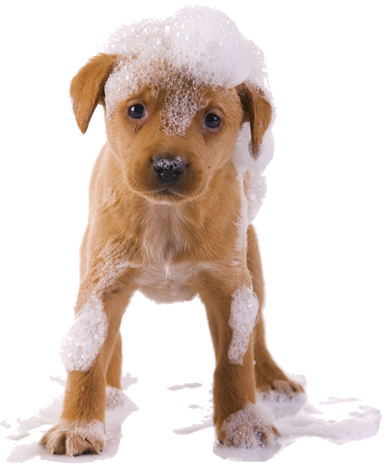 The Deluxe Power Bather produces a vigorous, penetrating spray of shampoo and warm water through a hand held sprayer that enhances the effectiveness of shampoos and conditioners while providing your pet with a luxurious massage. Not only will your pet be perfectly clean and effectively treated but they will love the massage treatment! Don’t let the term “house brand” fool you!. Les Poochs shampoos are considered by top breeders and styling professionals to be the finest shampoos in the world. 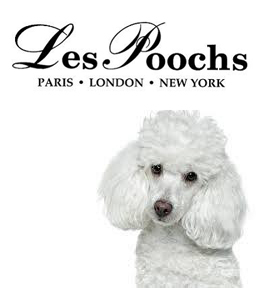 Les Poochs uses only the finest ingredients delivering the very best finish to both coat and skin. Pooch Botanique VIP Shampoo: Pooch Botanique’s concentrated crystal clear PH balanced formula represents the purest shampoo in the world and delivers a gentle yet thorough exfoliating wash to both skin and coat. This treatment enables the epidermis to “breath” without hindrance from heavy residue. Only once every two years can enough petals of the rare Osmanthus flower be picked and distilled to create the signature fragrance “Les Poochs V.I.P”. This ever evolving modern “living” fragrance energizes then soothes the olfactory senses for those lucky enough to smell it. Due to the high demand and limited quantity Les Poochs V.I.P is offered by invitation only. Canine Perfection has that invitation! This beautiful and diffusive fragrance, with its top notes of Mandarin Blossom and Pink Grapefruit, is the ultimate expression of the Perfumer’s art. It is light, fresh, elegant and dries down to the perfect accords of Sandalwood, Vetiver and Orris which, when combined with the rare Essence of the Osmanthus flower, creates a soft, warm and unique harmony. This is a truly distinctive fragrance made to be shared by a lucky Pooch and his master. Pooch Botanique VIP Crème Rinse : ​Pooch Botanique’s ultra light PH balanced formula represents a breakthrough in purity and simplicity in crème rinse development. Without the hindrance of heavy oils and humectants your pet’s skin will “breathe” while its coat will shine and feel smooth not greasy. This unique tearless, texturizing shampoo is formulated for puppies and pets with sensitive skin. This breakthrough formula combines the soothing properties of Swiss Chamomile extracts and Aloe Vera with deep nourishing properties of Pro-Vitamin B5. Swiss Chamomile, long known for its therapeutic properties, aids in the relief of skin ailments. Pooch Puppy’s gentle, tearless formula contains texturizing ingredients which will leave your pet’s coat full-bodied and with a “show finish” shine. Trimming: Skillful use of a top performance nail clipper that is well maintained and sharp for the most comfortable trim ever! Dull clippers pinch the nail before cutting and cause an uncomfortable pressure, and sometimes panic, for your pet. Your pet will love our technique and our clippers! Buffing: Using an electric rotary tool we can buff the nails to a smooth, splinter free, finish with the comfort and safety of your pet as our first priority. You will be amazed at how short the toe nails can be without stressing your pet. The Happy Hoodie was created to calm and protect pets from the loud noise and high-pressured air associated with force air drying in the grooming salon. It is a soft, expandable, fabric band with gentle compression that relieves anxiety and calms dogs during many stressful situations. It fits over the head closing the ear canal to reduce noise and absorb excess moisture. In addition to the Happy Hoodie, we also fill the ear canal with cotton. This is an important extra comfort for your pet because at the end of the drying process the Happy Hoodie must be removed to dry the head and ears. The cotton continues to dull the sound and protect the ear from the air. There are 3 methods to blow dry your pet depending on coat type and desired outcome. Forced air drying is the primary method. It involves a high concentration of air flow to further clean, thoroughly dry and de shed your pet. Fluff drying is used to de matt, de shed and straighten the coat for the perfect finish. Cage drying is used on many breeds with smooth and short hair as well as heavy coated breeds to assure that they don’t go home with any damp areas. Many pets, especially cats, enjoy this warm soothing method. We go to great lengths to make this potentially stressful stage of the grooming process as pleasant and enjoyable as possible. Our number one concern is that your pet is warm, comfortable and dry without being stressed or overheated.